Simon Weldon, chief executive at Kettering General Hospital and urgent and emergency care lead for Northamptonshire Health and Care Partnership, said: “When people need urgent treatment for an injury or medical condition they often head straight to their nearest hospital – but with demand and waiting times constantly changing, the closest location isn’t always the best. 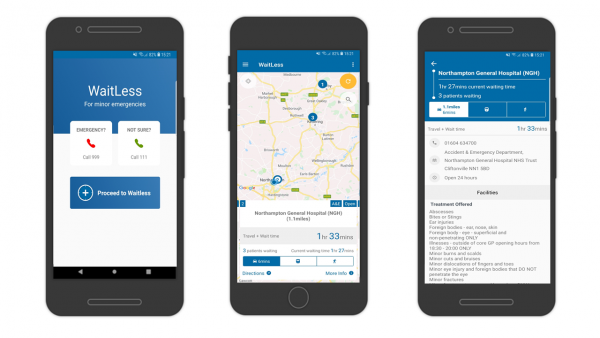 WaitLess allows people to quickly view the local urgent care and minor injury facilities where they can go for treatment and how long they are likely to wait to be seen there. Downloading the WaitLess app is easy: search the Apple App Store or Google Play for ‘WaitLess’ on your smartphone. For life-threatening emergencies, people should continue to dial 999. Urgent NHS medical advice is also available by calling 111 or online at 111.nhs.uk.